Each strawberry plant will produce a slightly varied weight of mature, ripe strawberries. Thousands of variables affect the production of each strawberry plant. The following is the normal expected strawberry production in pounds per foot of planted row. So, if you had two rows of strawberry plants that were 5 feet long each, the numbers below would be multiplied by 10 to get the total expected strawberry production for that strawberry patch. In the matted row system or the ribbon row system, the expected harvest should be between .5 and 1 pounds of strawberries per foot of row for June-bearing varieties during both the second and third years of life. In the matted row system or the ribbon row system, the expected harvest should be between .25 and .5 pounds of strawberries per foot of row for everbearing varieties during both the second and third years of life. In the matted row system or the ribbon row system, the expected harvest should be between .25 and .75 pounds of strawberries per foot of row for everbearing varieties during the first year of life. The expected harvest increases to between .5 and 1.5 pounds per foot of row for years 2 and 3. If you are looking for larger-scale data for commercial production, see this post on strawberry plants per acre. And, remember that you can never have too many strawberries! Also remember the mantra regarding how much to plant: When in doubt, plant more out! If you want to know smaller specifics (i.e. 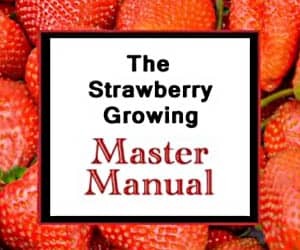 what quantity of strawberries an individual plant will produce, how many strawberry plants are needed to feed a family, and what number of plants are best for harvesting enough to freeze), just click here. I bought strawberry that hang in the basket. I pick one that is really red and look ripe but when I tried it is really sour. Is it because of the type of strawberry I have or it’s not ready yet. Hello. A friend of mine gave me several strawberry plants. They are producing fruit. I picked some of them after they were riped. Noticed underneath the berry, there’s a hole straight through!! Are still eatable?? What causes them to do that?? Keeping the soil temperature in the 60s with air temperature in the 70s is a good combination. It is best to keep the pH around 6.0 or slightly lower. Good luck! This might help. Good luck! What variety of strawberry would you recommend for the Matsu valley in Alaska located about 40 miles north of anchorage. Hi I was wondering if I have 25 plants how many should bloom ? If they are healthy, all of them should bloom if they were planted last year. If planted this year, it depends on whether or not the plants produced any perennating buds last fall. If they did, all 25 should bloom. If they didn’t, none will bloom. However, if you ordered and planted bare-root plants this year, it is best to pinch off the blooms to help the plants establish themselves for a bigger harvest next spring. Good luck! How come my strawberries are white? They either haven’t ripened yet, or are one of these. Good luck! Hi Mr. Strawberry, your responses to the questions others have asked are so helpful! So, I have one of my own. I am on year 2 of a bed of everbearing varieties, and I am thinking ahead to year 4 when these plants start to lose their vigor. Will I need to pull out all the plants and start from scratch at that point? Or, if I let the plants send out shoots (instead of pinching them off), will my plants produce their own next generation? The best options is probably adopt a transplanting system like this. Good luck! what is the time line of these estimates , will they produce that per week , per year , per month? what is the rate of production per plant. example day neautrals produce 1.5 pounds per foot per row every week , month or year? I’m from Barbados and very interested in growing strawberries here. Unfortunately, the strawberry plant is a temperate fellow. The heat of the tropics will cause them to die or under-perform. I wouldn’t recommend growing them there. But, if you attempt it, let us know how it goes! Good luck! June-bearing strawberry varieties will produce year after year with the appropriate care until they are about 4 years old. At that point, they can still survive, but their productivity decreases dramatically. But, yes, your June-bearers should produce again this spring. Good luck! How many strawberry plants can 24 strawberry seeds make. It depends on how long the time period in question is. If you get just one of the seeds to germinate, it can multiply into thousands of plants within just a few years, if the plants are given the appropriate care. Good luck! 1. With 10,000 sq, ft we should be able to grow appx. 1,400 plants. How many berries would each plant produce per year? 2. Would be have to rotate plants every 4 years as strawberries tend to dwindle in year 4? 3. Do you know the average cost per plant for dirt farming versus greenhouse cultivation? Do greenhouse berries produce all year versus just June? To grow continuously, you would need a day-neutral variety. They don’t produce as much gross strawberry mass as do the June-bearers, on average, but finely tuned hydroponic delivery can alleviate that somewhat. I’m not sure what the maximum crop yield would be in a hydroponic set up. With continuous production, you might need to plan on plant replacement every 2 or 3 years, although every 4 years might be possible. Unfortunately, I am not sure what the average cost per plant difference between conventional and hydroponic cultivation is. I’m sorry! Good luck! I live in suriname with a weather about 27-32° c. I have healthy and strong plants. Now they are 3 month old. Till now I don’t see any flowers. What is the reason? It is probably the heat. 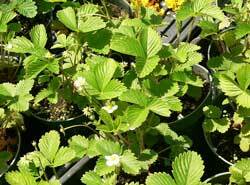 Strawberry plants will produce less or not at all when their roots get too warm. Good luck! We planted Albions last September and harvested this spring. We are going to cut them back for the summer and see if they’ll produce in the fall. If we don’t plow them up this winter, will they fruit again next spring? Yes, they should if they are healthy. Good luck! Hi I’m looking to grow strawberries indoors under grow lights and I’m looking for the best type of strawberry to use that will produce the most berries and if I keep the temperatures warm will they produce all year round? Typically, if you are going to be growing your strawberries indoors, it is best to use a day-neutral variety. Two of the most popular are Tribute and Tristar. Good luck! I am growing strawberries in a very moderate year-round climate (no winter season). They appear to be almost continually producing for the last two years. Does the yield of a strawberry plant usually increase each year? Will it stop producing after a certain number of years? Thanks! Yes, strawberry plants tend to increase their production each year between years 1 and 3 or 4. In year 4 or 5, production will normally abate rather quickly as the plants lose their vigor. Good luck! I live in Mongolia where it is hot in summer and very cold in the winter. Do you have any experience or advice to plant strawberry in harsh climate area and what sort of strawberry seed should we plant in Mongolia? Thank you so much. Unfortunately, strawberry plants don’t do well in very hot weather. I’d probably recommend trying to grow something else. Sorry! How many times a year can you harvest the seascape variety. I heard they regenerate once a week. So I’d be able to pick once a week. You can harvest anytime you have ripe berries! If your Seascape plants are producing, harvest and enjoy. Good luck! why is it recommended to deflower berries during the firt season? It allows the flowers to develop fully and establish good root systems prior to the added burden of growing berries. It is sort of like why you wouldn’t want a 12-year-old to get pregnant. She might be able to carry a baby, but a 22-year-old’s body will be much more able to handle the added burden because she would be fully developed by then. Hope that helps! Good luck! I am writing a book about strawberries. I happened accross your webpage and found it very interesting, containing such wonderful information. Would it be possible to use some of your content? Yes, with proper citation. If you write on a website, please include a link back to the referenced material/pages. Good luck! Is there a difference between male and female plants or do some plants not fruit the first year? Yes, some species of strawberries can be said to be distinctly male or female based on the structure of their flowers. Distinctly gendered plants will have only a pistil or a stamen, with the plants that are considered “male” bearing the stamens and the plants considered “female” bearing the pistils. The gendered strawberry varieties will require cross-pollination by a pollinating insect or human between multiple plants in order to produce strawberries. Most of the common garden strawberries, however, are hermaphroditic (meaning they have both the pistils and stamens in their flowers). But, they actually usually function as either male or female and will still require a pollinator (such as a bee). So, if your plant is a typical store-bought variety, the chances are good that it is a hermaphroditic strawberry hybrid. If it is a June-bearing variety, the flowers should be removed in the first year anyway (see the Growing Strawberries reference page). Check the information on that page, and you should be on your way to success. Good luck! Are there varieties of strawberries that don’t produce anything the first year? Most strawberries will produce relatively quickly. However, June-bearing strawberry plants should have their flowers removed during the first year to ensure better yields in subsequent years. Everbearers and day-neutrals will produce in year one.